DNA tests on British prehistoric mummies revealed they were made of body parts from several different people, arranged to look like one person. The four bodies discovered in 2001 on South Uist, in Scotland's Outer Hebrides were the first evidence in Britain of deliberate mummification. It is thought the body parts may have come from people in the same families. 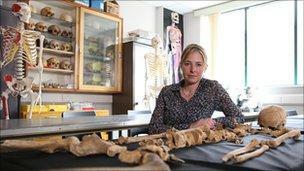 Sheffield University's Prof Mike Parker Pearson said the mummies had not been buried straight after preservation. 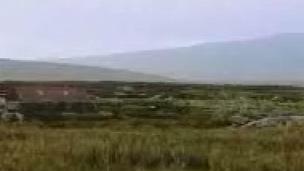 A team from the University of Sheffield first uncovered the remains of a three-month-old-child, a possible young female adult, a female in her 40s and a male under the prehistoric village of Cladh Hallan. But recent tests on the remains carried out by the University of Manchester, show that the "female burial", previously identified as such because of the pelvis of the skeleton, was in fact a composite. It was made up of three different people, and some parts, such as the skull, were male. Radiocarbon dating and stable isotope analysis showed that the male mummy was also a composite. Prof Parker Pearson, an expert in the Bronze Age and burial rituals has a theory about why the mummies were put together this way. "These could be kinship components, they are putting lineages together, the mixing up of different people's body parts seems to be a deliberate act," he said. "I don't believe these 'mummies' were buried immediately, but played an active part in society, as they do in some tribal societies in other parts of the world." He said as part of ancestral worship, the mummies probably would have been asked for spiritual advice to help the community make decisions. Archaeologists found the mummies in the foundations of a row of unusual Bronze Age terraced roundhouses. But after being radiocarbon dated, all were found to have died between 300 and 500 years before the houses were built, meaning they had been kept above ground for some time by their descendants. In order for the bodies to have been found as articulated skeletons as they were, rather than piles of bones, some soft tissue preservation had to have taken place. Further tests showed that the bones had become demineralised, a process caused by placing a body in an acidic environment like a peat bog. The degree of demineralisation on the bones found showed that after death, the bodies had been placed in bogs for about a year to mummify them before being recovered. Mr Parker Pearson said he believed there may be more examples of deliberate mummification in Britain that have been missed by archaeologists up until now. 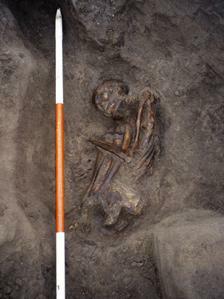 The Cladh Hallan mummies had been carefully placed in the crouch burial position, a style of burial where the body is drawn up into the foetal position, commonly found in the Bronze Age. Archaeologists are sometimes puzzled by how the bodies were contorted into such tight positions. Prof Parker Pearson's team are examining other crouch burial examples to see if these were in fact the mummified remains of much older bodies as well. Early results are proving to be promising, as a sample from remains in Cambridge show that bacterial decay was halted at some point after death.